« Is your therapist biased by money? Reposted from Sacramento Street Psychiatry. Sometimes an unruly character disrupts the surrounding peace and quiet. Loud, gruff words and ill-considered behavior mar the scene. Onlookers cringe, awaiting the impending destruction. For this beastly fellow is bound to break something: wreck a friendship or relationship, make a workplace intolerable. All the worse if the setting harbors sensitive souls with feelings easily hurt. It’s a disaster waiting to happen. We might say this person is a “bull in a china shop.” In this image a powerful animal threatens fragile items of great value. Its untempered impulses — hunger, lust, anger — may bring the edifice crashing down at any instant. Even the natural movements of a relatively calm bull may clumsily destroy order and beauty all around. The message is clear. This bull needs to be controlled, tranquilized, restrained if necessary. Or magically turned into something innocuous, a house-cat perhaps. As a last resort, it must be led out of the china shop without delay, before more damage is done. Certainly there are interpersonal situations described very aptly this way. However, in my psychotherapy work I’ve repeatedly encountered this scenario turned on its head. I’ve begun to look at the phrase differently: Maybe the bull isn’t always the culprit. 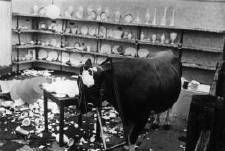 The phrase “bull in a china shop” usually implies that the china shop was there first. The bull wandered in uninvited. But suppose we set up the scene another way. Picture a bull grazing in an open field. Yes, it’s a big powerful animal, and maybe it’s a bit clumsy. But it isn’t hurting anyone; it is living in peace. Then imagine someone sneaks up on this bull — and builds a china shop around it. The animal suddenly finds itself constrained, unable to move without hearing the crash of broken porcelain. Its natural movements are now seen as destructive, as the china is surely at risk. Yet it isn’t quite right to blame the bull. In human relationships, the person with socially disturbing behavior hasn’t always caused the problem. This manifests most obviously in work with children, who frequently express parental distress through their own misbehavior. Even in adults, an apparently calm and mature person may quietly stir up someone else, who then becomes the “identified” patient (a term from family therapy implying that one or more other parties, equally worthy, evaded this identification). There is no small measure of passive hostility in building a china shop around a bull. All too often we observers arrive late upon the scene, only to witness the wild animal haplessly bumping into fragile dinnerware. It can take a long time to realize that the bull was just being a bull, and that the root problem was the apparently innocent bystander who constructed a china shop the bull was almost sure to topple. OMG! This story reminds me of my life, almost. Except the bystander knew exactly what it was doing. So of course this bull was gonna crash all the china….LOL.